There are currently no setups for Toyota celica Rally 92. Add a Setup. 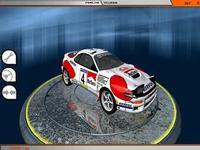 There are currently no car skins available for Toyota celica Rally 92. If you are a painter you can share skins for this mod via the Car Skins area. Visit the Spray Booth for painting tips & tricks. This mod is fantastic! It tought me how to drift in Rfactor but it can also drive like a dreamracecar too! Very nice model. But, no sound of engine ! Only thre sound of the tires, and a small turbo. ???? Please can we became a PERMISSION of this Car do use the Celica in a Hillclimb Challenge ? Only we would implate the Car in our Mod in a 4wd Class ! Is the Template for the Car in the MOD include ? INCOMPLETE. WIP at best. I hate to be so hard on it because it's more than I have ever produced for rF but come on. Finish and THEN release.